Connect with Lord Shiva today! Learn how to develop a deep personal relationship with Radha and Krsna with his help! This entry was posted in MP3. Please accept our obeisances. All glories to Sri Sri Guru and Gauranga. Sri Narada desired to proclaim the glories of Lord Siva. As previously described, he praised Siva as the greatest devotee of Lord Krsna and most dear to Him, and Lord Siva became upset by hearing those praises. Siva then related a number of incidents which, according to him, were evidence that he was not dear to Krsna at all. Now Lord Siva compares himself to Sri Prahlada Maharaja, (*See Endnote 1) the famed devotee of Lord Nrsimhadeva described in Srimad-Bhagavatam. He told Narada, “Sri Prahlada Maharaja is superior to me, and it is he who is the dear devotee of the Lord.” Even though Lord Siva is superior to Prahlada Maharaja, he told Narada that Prahlada Maharaja is superior. Why? He said this to encourage people to follow Prahlada Maharaja’s ideal character and teachings. However, Prahlada Maharaja cannot enter Sri Krsna’s transcendental abode, Vrndavana, whereas Lord Siva resides there eternally as Gopisvara. Siva serves Sri Krsna personally in numerous ways. He and his wife Parvati-devi meditate on asta-kaliya-lila, Lord Sri Krsna’s confidential eight-fold daily pastimes. These secret pastimes are very confidential, yet both Siva and Parvati are able to meditate upon them. Siva is hundreds of thousands of times superior to and more worshipable than Sri Prahlada Maharaja, and yet the artful Siva declared Prahlada Maharaja to be superior. Why did he do so? In one sense Prahlada Maharaja is superior, and in another sense he is not. From the point of view of Lord Siva’s function as the god of annihilation, and also that of Brahma as the secondary creator of the universe, Siva and Brahma are actually posts. Lord Brahma and Lord Siva are not ordinary human beings, but their posts are like that of the president or prime minister of a nation, wherein the man representing the post has to perform a certain defined job. Both as the post and the person, Siva is superior to Brahma. Lord Siva is an expansion of Lord Visnu, but sometimes a jiva may become Siva’s expansion known as Rudra. If a man purely performs the duties of varnasrama for one hundred births, he may become Brahma.6 In other words, he may attain the position or post of Brahma. In turn, when a person in the post of Brahma carries out his function expertly for one hundred births, he becomes qualified to perform the function of Siva in his manifestation as Rudra. Siva’s post is therefore superior to that of Brahma, and this is also evidence that Siva is more powerful than Brahma. What is the function of Lord Siva’s post, and why is it superior to that of Lord Brahma? One reason is that Brahma cannot execute pralaya, the complete destruction of the universe – a very dangerous thing, whereas Siva can do so. Siva’s function as destroyer is similar to that of a farmer who plants and cultivates a large area of wheat. The farmer carefully waters and nourishes the crop, guarding it from animals, and after five or six months the wheat matures and ripens. Then, either by hand or a machine, the farmer harvests the plants and carefully removes the grains from their shafts. The rest of the plant-matter becomes refuse, subject to rotting and attracting disease, vermin, and snakes. Therefore, the farmer sets fire to it and burns it. Just as the farmer extracts the grains from the plants, Lord Siva extracts the eternal spirit souls from their material bodies and from the world. At the time of annihilation he creates an inferno, setting the entire universe on fire, but the spirit souls are not destroyed. While the entire universe is submerged in water, the living entities rest in their subtle bodies within the transcendental body of Garbhodakasayi Visnu. They await the start of the next day of Brahma, the next material creation or manifestation. Some of them become liberated, and others do not. Lord Siva is not a living entity, but he is also not in the category of Lord Visnu. He is much more powerful than any living entity, even up to Lord Brahma. However, he is not equal to Lord Visnu. Because he is almost as good as the Supreme Personality of Godhead, he can see the three phases of time: past, present, and future. One of his eyes is like the sun and another is like the moon. He also has a third eye, located between his eyebrows. It is from this third eye that he generates fire and employs it at the time of the universal destruction. Seen from this perspective – the destroyer – Lord Siva cannot serve Sri Krsna directly, because he is engaged at his post. Those souls who are liberated after hundreds of thousands of lifetimes of devotional practice, having renounced all responsibilities and concerns of the world – including occupations like that of Brahma and Siva – and who constantly hear about, glorify, and remember Lord Krsna, take birth in this world as pure devotees like Prahlada Maharaja. This was told by Lord Siva to Sri Narada. Prahlada Maharaja has nothing to do with this world; nothing to create or demolish. He rejected all such affairs as insignificant. Although he had inherited a large kingdom, it was controlled and governed by his ministers. His senses were totally absorbed in the transcendental loving service to the Supreme Lord. He was always engaged in hearing the name and glories of the Lord, singing and speaking about his glories, remembering and meditating on him, offering prayers, carrying out the his orders and fully surrendering to him. Devotees in Prahlada’s category have no need to approach Lord Krsna’s manifestations like Lord Nrsinhadeva and Lord Rama, for the Lord personally comes to them in these forms. Lord Siva told Sri Narada that because he is always engaged in the post of controlling the universe, he can neither see nor offer services to the Lord daily, as Prahlada Maharaja sees Lord Vamanadeva or Lord Nrsinhadeva. Vamanadeva and Nrsinhadeva are both manifestations of the same Lord, who regularly gives Prahlada his divine association and the opportunity to serve and offer obeisance at his lotus feet. Although both Brahma and Siva are actually superior in bhakti to Prahlada Maharaja, their posts involve contact with the three gunas, or modes of material nature, namely goodness, passion, and ignorance. The role of Lord Brahma is creation and procreation in raja-guna, the mode of passion. Lord Siva’s role of demolition and dissolution is in tama-guna, the mode of ignorance. It is for this reason that they are called guna-avataras, incarnations of the material qualities. Prahlada Maharaja is nirguna, transcendental to the three modes of nature. He has nothing to do with activities in material goodness, passion, and ignorance, by which this world is shackled. Lord Siva is also beyond the three modes of nature, but he adopts the mode of ignorance (tama-guna) to efficiently perform his function. Regarding Lord Siva’s glorification of Prahlada Maharaja, now consider Lord Siva’s identity as a transcendental personality – separate from his post. Out of sincere humility, gratitude and affection, liberated souls speak in this endearing manner, and at the same time they are fixed in the realization that they are always being personally maintained by the Supreme Lord. 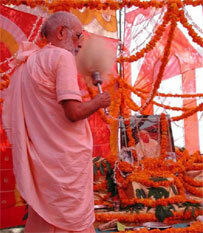 The senior Vaisnava has the disciple’s personal benefit in mind. However, Lord Siva was not speaking for Prahlada Maharaja’s benefit, but to acquaint aspiring devotees with the stages of devotion. His desire was to facilitate the service of Sri Narada Muni and Srila Sanatana Gosvami (*See Endnote 6), whose mission was to establish in the world the sequence of the grades of devotion and ultimately establish the glories of the gopis. Try to understand all these truths, and seek to gradually become firmly situated in bhakti. Imagine that you are in a market in which there are thousands of varieties of shops. In some of those shops there are products made of iron, in some shops there are products made of gold, in some there are jewels, and in others cintamani (wish-fulfilling stones). An expert is guiding you through all the shops, pointing out different products and revealing which are superior. If there are a thousand pounds of iron and only one ounce of gold, the gold has more value. On the other hand, many pounds of gold will not amount to the value of one Kaustubha-mani or a similarly precious stone. Millions of such precious jewels cannot compare with a tiny quantity of cintamani, and even millions of cintamani stones cannot compare with one holy name of Lord Krsna. Now suppose someone is chanting the name of Lord Krsna alone, and another is absorbed in the name of Radha-Ramana. The name Radha-Ramana, meaning Sri Krsna, the enjoyer of pastimes with Srimati Radharani, has more transcendental taste (rasa) than the name Krsna alone. The person absorbed in that holy name will therefore experience a greater spiritual pleasure. Regarding the analogy of the shops in a market, that expert tells you, “This shop is good, that shop is better, and this one is the best. 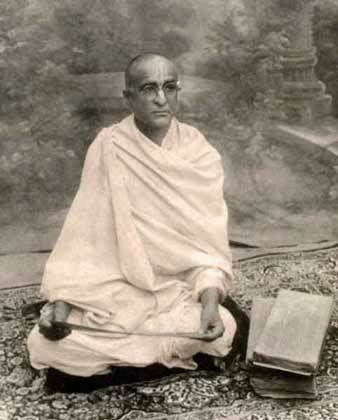 Similarly, in his Sri Brhad-bhagavatamrta, Srila Sanatana Gosvami establishes the gradations of excellence of various devotees and their devotion, in order to help his readers determine their spiritual path. The history of Narada Muni’s coming to the abode of Lord Siva and glorifying him was first narrated in this Sri Brhad-bhagavatamrta. Like Srila Sanatana Gosvami, Narada is also that expert described above. He desired to establish pure bhakti in the world, and therefore he played the role of searching for the greatest devotee and recipient of Lord Krsna’s mercy. His search had taken him first to the “shop” of a brahmana in Prayaga, and after that to South India, to the shop of a king. Then he traveled to heaven, where he entered the shop of King Indra, and Indra sent him to the shop of Lord Brahma. Brahma sent him to Lord Siva, and Lord Siva is now sending him to Prahlada Maharaja. Gradually, Sri Narada will bring us to the greatest recipients of Lord Krsna’s mercy, the gopis. In the form of Gopisvara, Lord Siva is the beloved servant and associate of those gopis. Lord Siva is actually most dear to Sri Krsna, and therefore Krsna can give him services which He cannot give anyone else. When the demigods and demons were churning the Milk Ocean in order to obtain the nectar of immortality, the first substance produced was a powerful and dangerous poison, burning the entire world. The demigods appealed to Sri Krsna, and He advised them to request Lord Siva to drink the poison. Thus, they worshiped Lord Siva and prayed, “Please save us! Only you can protect us!” Lord Siva collected the poison and took it in his mouth, but he hesitated to swallow it, considering, “Lord Krsna is in my heart. The poison will affect Him.” He therefore kept the poison in his throat, which was burned, and his neck turned the color blue. 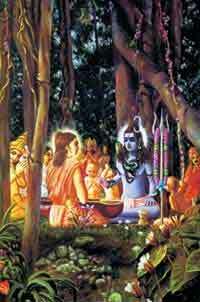 Lord Siva also expressed to Narada his regret in having given benedictions to Lord Krsna’s enemies. To fulfill his Lord’s desires, he had given benedictions to demons like Ravana, Vrkasura, Salva and Jayadratha, and thus he had performed many activities that were seemingly opposed to Krsna and krsna-bhakti. Siva and Narada continued to discuss some historical incidents which, according to Siva, proved that he was not dear to Krsna – but according to Narada, proved the opposite. Two of the Pandavas, Bhima and Arjuna, immediately chased after Jayadratha. Bhima dismounted his chariot and ran faster than Jayadratha’s horses. With his bow and arrows, Arjuna created a fire that surrounded the chariot of Jayadratha, who was then captured and could not move. Severely beaten by Bhima and arrested by Arjuna, Jayadratha was bound to the chariot and taken to where Yudhisthira Maharaja had been staying with Draupadi. Arjuna then shaved King Jayadratha’s head, leaving five patches of hair, and he shaved one side of his face, leaving the other side unshaven. Jayadratha felt humiliated, and after being released by Bhima and Arjuna he considered it better to have died. He thought, “I will somehow take revenge.” Thus absorbed, he went to Gangotri in the Himalayas and undertook a severe type of penance to please Lord Siva. Envious of Krsna and with a desire for the strength to destroy him, the demon Salva also took shelter of Lord Siva. He performed a severe type of austerity and ate no more than a handful of ashes daily. After one year, Lord Siva became pleased with him and asked him to beg for a boon. Lord Siva agreed, and Salva was helped by the demon Maya Danava to manufacture a mystical airplane that began to destroy Dvaraka, Lord Krsna’s abode. Salva personally attacked from above, and his soldiers attacked on the ground. Headed by Pradyumna, the Yadu dynasty warriors fought with Salva and his army, but they could not defeat him. Finally, Lord Krsna personally appeared on the battlefield, and after much intense fighting on both sides and many mystic displays by Salva, the Lord took up His disc, cut off the demon’s head, and gave him liberation. In this way, the benedictions given by Lord Siva to the enemies of Lord Krsna always have a weak point – a loophole. Lord Siva is extremely clever, and he is always serving his Lord, Sri Krsna. Narada knew this fact, and he wanted to publicize Lord Siva’s glories. Siva is very near and dear to Krsna, and non-different from Him. Try to always honor him, for he is Krsna’s greatest devotee. The principle of Siva – Siva-tattva – is extremely complex. The principle of Brahma is not as complicated, because Lord Brahma is always a jiva, a finite spirit soul. Sometimes, when there is no qualified jiva, Lord Visnu (Krsna’s expansion) personally takes the post of Brahma, but that is rare. Lord Siva is not like that; he is not a finite soul. After passing through the eight material coverings, and after crossing the Viraja (the river that divides the material world and the spiritual world) and the planet of Lord Brahma (the highest material planet), one comes to the planet of Siva. There he is known as SadaSiva, a manifestation of Lord Visnu. Lord Siva eternally resides in Lord Krsna’s abode, Vrndavana, where he manifests many forms to render devotional services to Him. The form of Gopisvara Mahadeva (*See Endnote 9) was manifested by Lord Krsna’s desire. When Krsna desired to perform His rasa dance, Srimati Radhika, the embodiment of His pleasure potency, manifested from His left side and Gopisvara Mahadeva manifested from His right side. The form of Siva who lives in Kasi or Kailasa in the material world is a partial manifestation of the original Sadasiva in Vrndavana. The many other commonly worshiped forms of Lord Siva are expansions of Sadasiva. They are not the original. Partial expansions such as Pippalesvara Mahadeva, Bhutesvara Mahadeva, Rangesvara Mahadeva and so on cannot award the benediction that can be attained by the mercy of Gopisvara – the highest perfection of love, namely vraja-prema. I daily worship Gopisvara Mahadeva, who is situated on the bank of Yamuna. That very Gopisvara was worshipped with deep devotion by the gopis, and he quickly fulfilled their desire to attain a supremely precious jewel in the form of the embrace of the son of Nanda Maharaja [Krsna]. Srila Sanatana Gosvami, the great Vaisnava saint who resided in Vrndavana near the old Sri Madana-Mohana temple, would go daily to see Sri Gopisvara Mahadeva at his temple. Once, in his older years, Sanatana Gosvami had a dream wherein Gopisvara Mahadeva appeared and instructed him: “Now that you are old, please do not go through so much trouble to see me.” Sanatana Gosvami replied, “I will continue to come. I cannot change this habit.” Gopisvara Mahadeva said, “Then I will come and stay very near to your residence, manifesting in Bankhandi.” The very next day, Sri Gopisvara Mahadeva appeared in Bankhandi, halfway between his orginal temple and Srila Sanatana Gosvami’s residence. Seeing this, Sanatana Gosvami became overwhelmed with transcendental ecstasy, and from that day on he visited Bankhandi Mahadeva every day. We honor Lord Siva as a great Vaisnava and as Guru. We do not worship him separately. We observe Siva-ratri, Lord Siva’s appearance day, and we glorify him in connection to his relationship with Sri Krsna. Srila Sanatana Gosvami has written in his Hari-bhakti-vilasa that all Vaisnavas should observe Siva-caturdasi (Siva-ratri). Lord Siva, in whom all good qualities reside, should certainly be honored by the observance of this day. O Gatekeeper of Vrndavana! O Soma, all glories to you! O you whose forehead is decorated with the moon, and who is worshipable by the sages headed by Sanaka, Sanandana, Sanatana and Narada! O Gopisvara! Desiring that you bestow upon me prema for the lotus feet of Sri Sri Radha-Madhava, who perform joyous pastimes in Vraja-dhama, I offer obeisances unto you time and again. Srila Sanatana Gosvami was practicing bhajana near the Yamuna River at Kaliya-hrada, the former abode of the very poisonous snake named Kaliya. Kaliya-hrada was close to the Yamuna, and therefore its surrounding area was full of sand. Srila Sanatana Gosvami wore only a loincloth. He used to go begging door-to-door for a small amount of prasada (Krsna’s food remnants), and would take as his meal only one dry chapatti (flat bread), with no salt. He thus returned, and Sanatana Gosvami asked him, “Why have you come back?” He replied, “I’ve come because I know that you have more valuable jewels than this.” Sanatana Gosvami then said, “Go and throw the touchstone in the Yamuna. The brahmana did so with all his power, and then Sanatana Gosvami told him, “Come here. Come here.” He gave him the mantra, “Hare Krsna Hare Krsna Krsna Krsna Hare Hare, Hare Rama Hare Rama Rama Rama Hare Hare” and said, “I do not have worldly jewels, but I have transcendental jewels. The jewel of Lord Krsna and Sri Radha will come to you in a very short time. So remain here. Your daughter’s marriage will take place automatically. Stay here and chant Hare Krsna.” That brahmana followed his instruction and became a very elevated saint. *[Endnote 1] In the hermitage of Sri Narada Muni, Prahlada Maharaja heard the message of Srimad-Bhagavatam while within the womb of his mother. From his birth, Prahlad was fixed in transcendental realization of the all-pervading presence of the Supreme Lord, and he preached love of God to his schoolmates at the tender age of five. Despite efforts by his atheistic father to change his nature – efforts that culminated in repeated attempts to kill him by means of administering poison, putting him in boiling oil, tossing him from the top of a cliff and so on – Prahlada continued to experience great joy by remembering Lord Visnu and chanting his holy names. Prahlada was protected by the Supreme Lord in every situation. Finally, Lord Visnu appeared in the form of a half-man, half-lion and killed his demonic father. When offered a benediction by the Lord, Prahlada simply asked for the liberation of his father, as well as that of all conditioned souls. 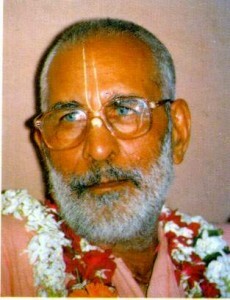 He is honored in this world by all pure devotees. *[Endnote 2] “Srila Madhvacarya is the original acarya for those who belong to the Madhva-Gaudiya-sampradaya.”(SB 6.1.40.purport) “This Madhva-Gaudiya-sampradaya is also known as the Brahma-sampradaya because the disciplic succession originally began from Brahma. Brahma instructed the sage Narada, Narada instructed Vyasadeva, and Vyasadeva instructed Madhva Muni, or Madhvacarya.” (Krsna Introduction). Varnasrama-dharma – the institutions dividing society into four divisions of social life and four occupational divisions of castes. *[Endnote 7] Lord Siva was referring to the long history in relation to Sripad Sankaracarya’s propagating the concept of the living entities’ oneness with God in all respects. Before the appearance of Sankaracarya fifteen hundred years ago, voidist Buddhism, which rejects the Vedas, was prominent in India. Sankaracarya is an incarnation of Lord Siva, the topmost devotee of the Lord. However, in order to drive away Buddhism and re-establish Vedic authority, he had to compromise with the atheistic Buddhist philosophy and preach a non-devotional doctrine. “Lord Siva wanted to become a gopi. He performed austerities, and when Paurnamasi Yogamaya became pleased and appeared before him, he prayed to join Krsna’s rasa-lila. Paurnamasi mercifully assisted him in dipping in Brahma-kunda, and he immediately assumed the form of a teenage gopi. He then went to the place where rasa-lila was being performed, and hid there in a grove. This entry was posted in Bhaktabandhav Team, Hari Katha, Harmonist, Movies, MP3. [ Most appearance and disappearance days in our Vaisnava calendar are observed in various countries on different days according to the local astrological timing: some holidays are observed over a two or three day period. This year, for most places of the world, this auspicious holy day (of Srila Bhaktivedanta Narayana Gosvami Maharaja disappearance day) is observed on December 11th. What are the causes of fear? Srila Sukadeva Gosvami has explained it. We all fear. Although everyone in all species of life throughout all the material universes only wants peace of mind and happiness, everyone is full of fear. Happiness and peace of life follow us like a shadow. If we want to take that shadow within our grasp, we will find it to be intangible – with no substance. On the other hand, when we proceed forward, turning away from our shadow, that shadow will follow us. This is the nature of shadows. Perhaps all of you know the meaning of maya? Maya, in the form of economic development, sense gratification, and impersonal liberation, is like a shadow. When we turn to her and try to enjoy sense gratification, we find sense gratification to have no substance. In other words, the desire for material happiness becomes the cause of pain and grief. There is no happiness in the material world, only distress and suffering, and this suffering is experienced as the endless chain of birth and death. No one is happy to be in maya. On the other hand, if we progress towards Krsna, then all material facility and liberation will follow us. We are part and parcel of the Supreme Lord, Krsna, and He is an ocean of ananda, unlimited happiness and peace. He is the reservoir of pure ananda, and in fact He Himself is ananda. Because we are His parts and parcels, by our constitutional position, by nature, our bodies are made of pure ananda. This refers to our transcendental body, however, not our material body. Somehow we have departed from that Supreme Lord, the ocean of rasa and ananda, who is ananda Himself, and now we are entangled in illusory maya. Ma – Ya. We are seeing that which is not actually a fact to be a fact. Whatever we see or feel by our sensory perception is maya. When we first departed from Krsna, when we first forgot Him, maya came at once and attacked us. She defeated us and put us in her jail. What is that jail? It is this body and mind. Actually there are two jails, one within the other. This gross body is the outer jail and the subtle body is the inner jail. We have been suffering and fearing since time immemorial, and we are never free from that. Pariksit Maharaja asked Srila Sukadeva Gosvami, “How can we come out of this endless chain of birth and death? How can we get free from maya?” Srila Sukadeva Gosvami replied, “Tan-mayayato budhaabhajet tam / bhaktyaikayesam guru-devatatma.” Being in maya, we cannot become free from maya at once and go to Goloka Vrndavana. It is possible only by the help of Vaisnavas. By the association of pure Vaisnavas, you can have a very pure guru – not an imitation guru or a kan-guru, but a sad-guru. If we take shelter in his lotus feet, he will take full charge of our lives. He will take all kinds of responsibility for our lives, and he will teach how to do bhajana of Krsna. Guru-devatatma. First, we must think that guru is our atma. Being totally surrendered to him, we must depend solely on him. Tan abhajet. Tan means the Supreme Lord, Krsna. If we serve Krsna under the guidance of sad-guru, then certainly, like magic, we will be out of maya. We will see that our transcendental form has manifested, that we are serving Krsna, and that we are now bathing in the endless ocean of ananda and rasa. At that time we will also be embodiments of ananda, and we will simultaneously be the enjoyers of ananda by serving. Try to realize all these facts. It is not sufficient to simply hear about this and tell others. We will have to be established in this truth. We are in deep maya, and to the extent we are in maya we are that far away from Krsna. Our only hope is the fact that Krsna has sent sad-guru and Vaisnavas to this world. I realize this; I was a third-class bogus person, but my Gurudeva picked me up and engaged me in this transcendental service. To give the happiness of direct service to Radha-Krsna Yugala is the mission of Srimad Bhagavatam, Sri Narada Rsi, Srila Sukadeva Gosvami, Sri Caitanya Mahaprabhu, our guru-varga, and especially, in Western countries, Srila Bhaktivedanta Swami Maharaja – who ordered me to also preach it. I request you all to understand these eternal truths and be established in them, and to also preach this mission of our guru-parampara to others. If you are practicing but not preaching, you are selfish. Do not be weak. Preach. It is stated in Caitanya Caritamrta: “Sthane sthitah sruti-gatam tanu-van-manobhir” If you are wearing the saffron cloth of a brahmacari or sannyasi, do not marry and do not fall down. If you are grhastha, then remain grhastha, but after you are fifty years old, try to come out of grhastha life. Do not engage your whole life in the grhastha asrama. If you can be a grhastha like Prahlada Maharaja or the Pandavas, that is fine; but that is very rare. Today is a very sacred day. It is Nandotsava (the celebration of Krsna’s birthday). Nanda Baba, Yasoda Maiya, and all the elder Vrajavasis had as their son the Supreme Lord Krsna Himself. Krsna took birth on the previous day, at midnight, and today, one of the associates of Krsna, Abhaya Caranaravinda, Srila Bhaktivedanta Swami Maharaja took birth. How many years before? 109. In a couple of years, he translated and wrote so many books – Gita As It Is, Srimad-Bhagavatam, Caitanya-caritamrta, Easy Journey to Other Planets, Krsna book – so many books. They became very popular books. By these books, in a couple of years, he preached everywhere in the world. He established preaching centers in forests, on hills, and in the midst of oceans. Whether or not he has established centers in the sky, I don’t know. He established them practically everywhere. Thus, you see that people have come and joined from all parts of the whole world. Question: In what way did our Prabhupada think he was saving his disciples by telling them that the Gaudiya Math didn’t preach?